Successfully Added Electro-Mechanical Flip Clock with Alarm and White LED Lights (Black) to your Shopping Cart. 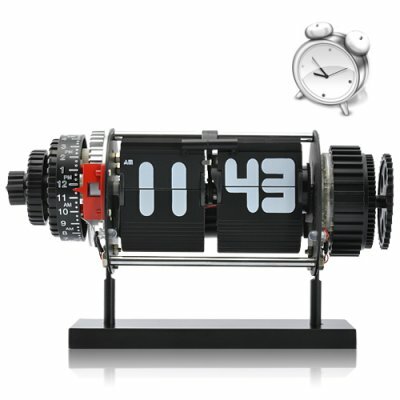 Old school functionality meets new school style with this unique, readable Electro-Mechanical Flip Clock with Alarm. Powered by high-precision electronics, this Electro-Mechanical Flip Clock turns the wheels of time through gear operated flip swatches, showing time as popular models did in the pre-digital age. Watch as seconds turn into minutes as the exposed workings show every second go by, accompanied with a soft, yet enchanting sound of "tick, tick, tick". When you need to adjust the time, the turn dial is conveniently situated on the left side of the clock as well as settings for the alarm. With its unique design and ease of use, this flip clock is the perfect desk accessory for home or office. Kids and adults alike love the industrial style, so this clock also makes the task of gift-giving easier than ever. Take a trip back in time with the Electro-Mechanical Flip Clock. Brought to you by the cool clock China wholesale and dropship experts - Chinavasion. This retro clock is so cool it got up on stage and jammed with The Killers at their last concert. This retro clock is so cool, it taught Tupac how to rap.